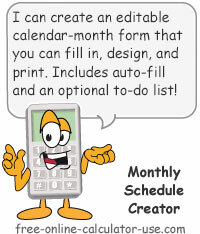 Select the month and enter the 4-digit year for the calendar page you wish to fill-in and print, then click the click the Create Blank Calendar to Fill In button. This will insert an editable calendar immediately below the Auto Fill-in section. Note that depending on the width of the calculator, you will see either a form optimized for mobile devices (narrow widths) or a form optimized for desktop devices (wide widths). After creating a blank calendar you can tap the &plus; icon to expland this section to auto-fill notes that reoccur on a regular basis throughout the month. Once you have entered a note and completed one of the auto fill-in options, tapping the Auto Fill-In button will populate the corresponding days with the entered note. To clear notes from all days, click the Clear All Notes button located directly beneath the calendar. Tap the − icon to collapse this section when it's no longer needed. Enter the text you wish to enter using the auto fill-in feature. Note that using the return key will automatically add a gray separator line on the printed calendar page (a line break is automatically entered for you at the end of each note). Note that you can scroll down and tap on any of the calendar days to enter notes directly into the calendar day cells without using the auto fill-in features. Tapping this option will display a form for entering reoccurring notes for fixed intervals and/or specified time frames. For example, if you work out every other day, you could enter: Work Out and Every 2 day(s) from days 1 to 31. Or, if you are going on a 7-day vacation from the 6th-13th days of the month, you could enter: Vacation and Every 1 day(s) from days 6 to 13. Tapping this option will display a form containing check boxes for indicating reoccurring notes that happen on the same days of each week. For example, if you have church at 7:00pm every Wednesday you can enter 7:00 Church and then check the Wednesdays check box. Or if you work different times on different days of the week, you can check the appropriate boxes for each reoccurring shift. Add to text?Add to text? :Add to existing text?Add to existing text? If you wish to add the auto fill-in notes to existing notes, select Yes before clicking the button. Or, if you want to replace existing notes, select No. This will overwrite all notes contained with days that are being auto-filled. Tap the &plus; icon to expand the design and to-do list section where you can change the default settings for fonts, borders, and dimensions. Tap the − icon to collapse the design and to-do list section. Select the desired font family, font color, and font size for the calendar title (the title is the month and the year). Select the desired font family, font color, and font size for the cell headings (the cell headings consist of the subtitle and the day numbers). Select the desired font family, font color, and font size for the notes (the notes consist of notes for each day, and the optional to-do list items). Select the desired type, color, and thickness for the calendar borders. Enter the width and height of the preferred calendar dimensions in inches. Note that you should be able to use the Print preview, Scale , and Portrait/Landscape features in your web browser menu to size the calendar before printing. If you have a list of things you would like to get done this month, simply enter each to-do item separated by a line return. The schedule creator will add an 8th column to the calendar, and provide a checkbox for each to-do item. If you leave the to-do list blank, no 8th column will be added. This calendar calculator will create an editable month-schedule template within which you can enter notes (events, activities, appointments, birthdays, etc.) for each day of the selected month. Also includes a cool auto fill-in feature for entering reoccurring events and activities, an optional to-do list, and various calendar page design preferences. Finally, once you have entered all of your events and activities and you have chosen your design preferences, a simple click of a button will open your printable calendar page in a new window for printing. Create personal calendar pages to hang on the fridge. Create a work schedule template for handing out work schedules to employees. Create a meal schedule for an entire month. Create a blank calendar to fill in later. Create a blank appointment calendar with designated time slots. Select the month and enter the 4-digit year you wish to create a calendar for, and then tap the "Create Blank Calendar" button. Use the auto-fill feature to add reoccurring notes to the calendar. Tap on any day within the calendar to open and edit the notes for that day. Tap the "+" icon in the "Design and To-Do List" line to expand the section. You can then edit the default design settings and/or add a to-do list to the calendar. Tap the "View Printable Calendar" button to view or print the calendar with its notes and settings. Note that you can close the printable calendar window and makes changes as often as is necessary to get the calendar the way you want it before printing.